Each fall when Matt and I go to his aunt’s and uncle’s cottage, we sleep in the back sunroom. 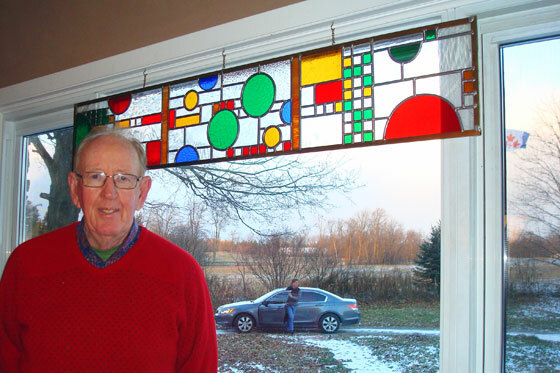 Surrounding us at the top of every single window are beautiful stained glass panels made by Matt’s uncle Bill. The first time we visited, I remarked on the beauty of the shapes and the colours in the windows. Uncle Bill said, “That’s a Frank Lloyd Wright pattern.” I knew of Frank Lloyd Wright, of course, but I wasn’t that familiar with his work, so once at home I looked up his windows and found the Coonley playhouse with its fabulous windows. Now, the thing that you should know about me is that if you offer, I’m always going to say yes. So I said, “Absolutely. Yes, please. That would be wonderful. I’d like one like you have in your sunroom please.” I went home and measured the dimensions of our dining room window and sent them off to Bill. A few months later, Uncle Bill and Aunt Helen showed up at Christmas with a long package wrapped in bright poinsettia patterned fabric. Inside was our very own Coonley playhouse stained glass. When we sold our first house, I ever so carefully took down the window, wrapped it and brought it to the farm. Just like at the last house, I hung it in the dining room. When Bill was here a few weeks ago, I made him pose for a picture. This window faces east, so each morning when I eat my breakfast, beautiful colours are cast over the room as the sun rises. 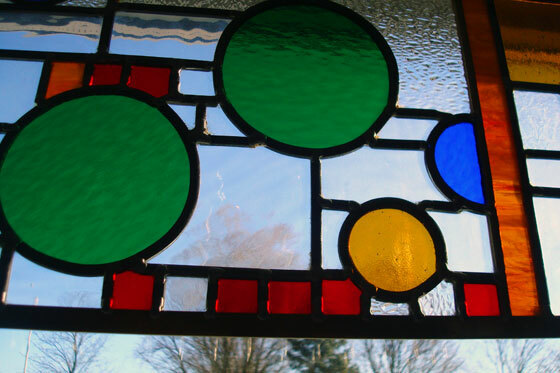 At our last house, the stained glass panel fit perfectly within the frame of the window and spanned right across the top. 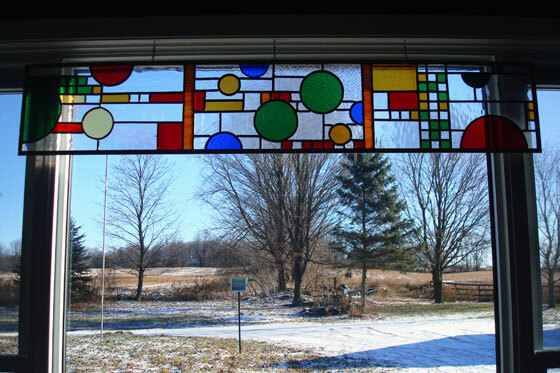 The dimensions of the dining room window are a little different than at our last house, and Bill keeps offering to cut the stained glass to the right size, but I don’t want to lose any of the wonderful pattern. Plus, I have lots of good memories from our first house and knowing this window was there first is a nice reminder. Here’s a detail shot so you can see some of the different types of glass. There’s pebbled glass, wavy glass and clear, along with all of the coloured shapes. According to the MOMA web site, the brightly coloured shapes are supposed to “suggest balloons, confetti, and flags.” Happy things. And happiness is what I feel when I look at this window. Do you have any stained glass at your house? Have you ever made stained glass? Are there any Frank Lloyd Wright fans out there? Beautiful! Can he make me one? LOL. But seriously….does he sell his work anywhere? I have one piece of clear stained glass (does it count as stained glass if it’s clear??) in the shape of a triquetra. We got it for Christmas one year and we love it. I don’t think he sells but I’ll ask Meghan. Maybe I can convince him to take a commision. I am a Frank Lloyd Wright superfan (if there is such a thing)! I could talk for hours about him! I have been to a couple of his houses and to Taliesin in Wisconsin. I am not so sure I would have liked his personality if I had ever met him, but his design was gorgeous! I recognized Coonley playhouse design right away! You are lucky to have that piece and your uncle is super talented! I’d like to see some of his houses in person. Do you have a favourite? I just HAVE to see Fallingwater some day! But I loved Taliesin because that’s where he lived and worked. It was designed for his own use and not a client. Your stained glass piece is gorgeous! It must be beautiful with the sun coming through it. What a nice way to start the day! I live in a 1918 Eaton’s catalogue house and have only two disappointing facts about it to share. There were no sliding doors (we put two in) and it had no stained glass. I have often thought about finding one to fit inside a window. I would look for a typical prairie style one. Thanks for sharing your link. It looks like a project you’ve been working at for some time! Good luck in your hunt for stained glass.